Marshmallow Peeps have been around since 1953, making this their 66th year of bringing joy and soft, puffy, chewiness to Easter baskets and fun recipes all over the nation. These adorable Peep’s nest Easter cupcakes are easy to make and sure to inspire smiles for anyone lucky enough to receive one. In all honesty, I’ve never been a big fan of eating Peeps. I actually prefer them slightly stale if I am going to consume the festive, blob of a bird. Apparently, I’m not alone–according to the company’s research, 25-30% of their customers prefer eating Peeps stale! When marshmallow is exposed to air, it dehydrates which causes a stale Peep to have a bit of a crunch. If adding a bit of texture to the colorful chick is also your preference, you may want to leave your Peeps out overnight before preparing these cupcakes. 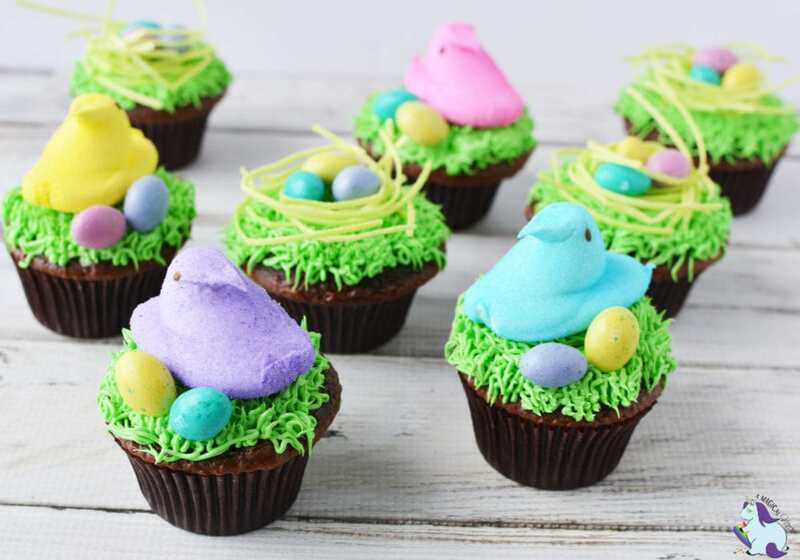 Regardless of your Peep-freshness-preference, these cupcakes are fun to make and impossible to resist. 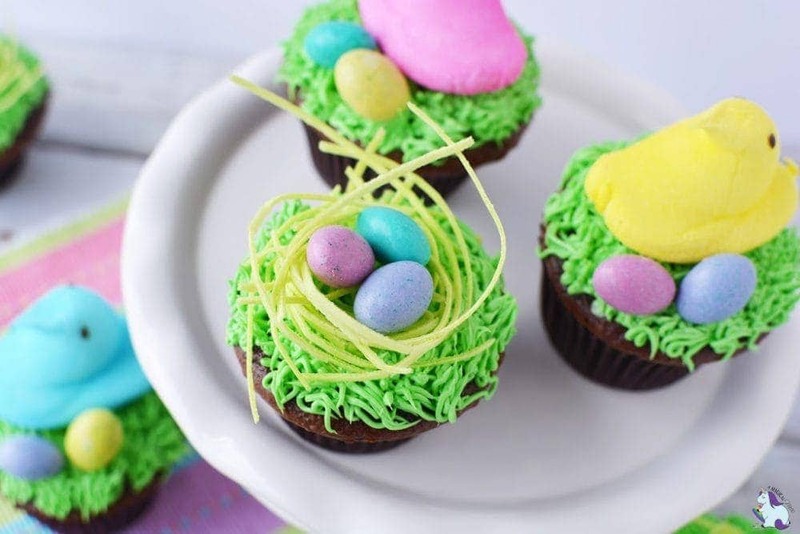 Edible Easter grass makes the nests super easy to build and seasonal M&Ms complete the look and add a yummy chocolate crunch to the mix. 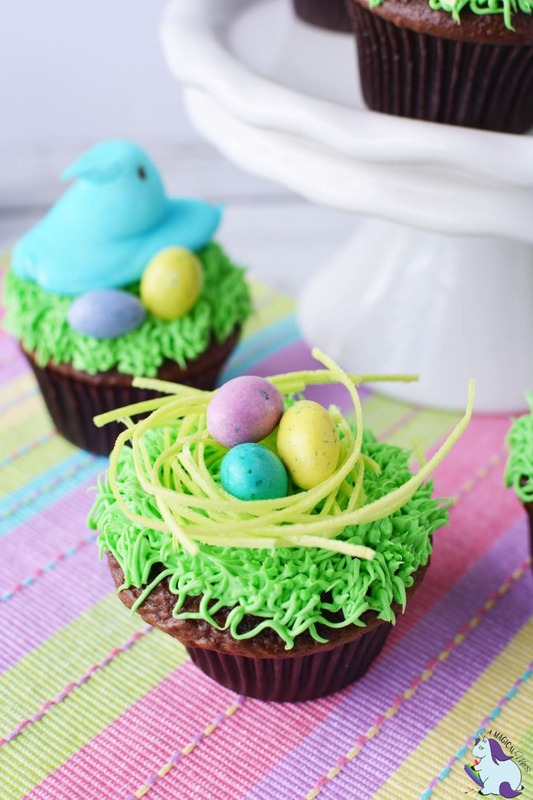 Use your favorite chocolate cupcake recipe to make these Easter nests. Here is the recipe for chocolate cupcakes that we use. 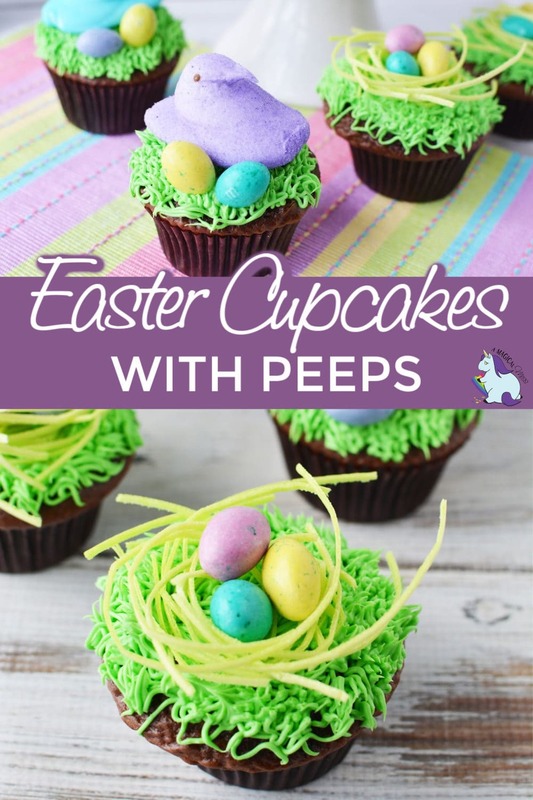 These cute and easy cupcakes are perfect for Easter or a springtime baby shower! Tint frosting green with food coloring and place into a pastry bag fitted with tip 233. Pipe grass onto each cupcake. Note: Store-bought frosting will work fine for this. It’s not quite as thick/dense as it should be to pipe beautiful grass, but the grass will look fine. Use short, 90 degree pipe and pull technique to create the most realistic grass. Edible Easter grass is usually folded in half in the bag. Take three strands and tear in half–tearing where it’s folded. Line up all six strands and roll them into a small circle, just a little larger than a quarter. Some of the pieces will break and that’s okay. Place onto the top of a cupcake. 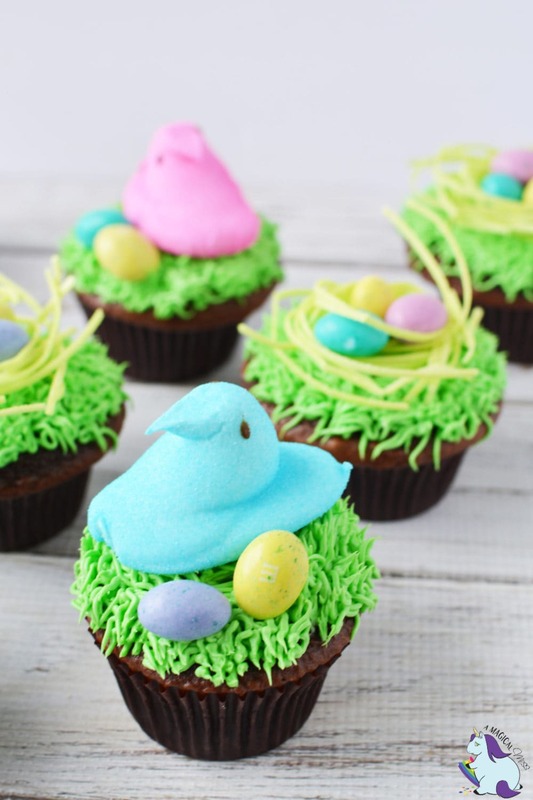 To make the Peep cupcake, place a Peep on top of the nest and add 2 M&M candies. 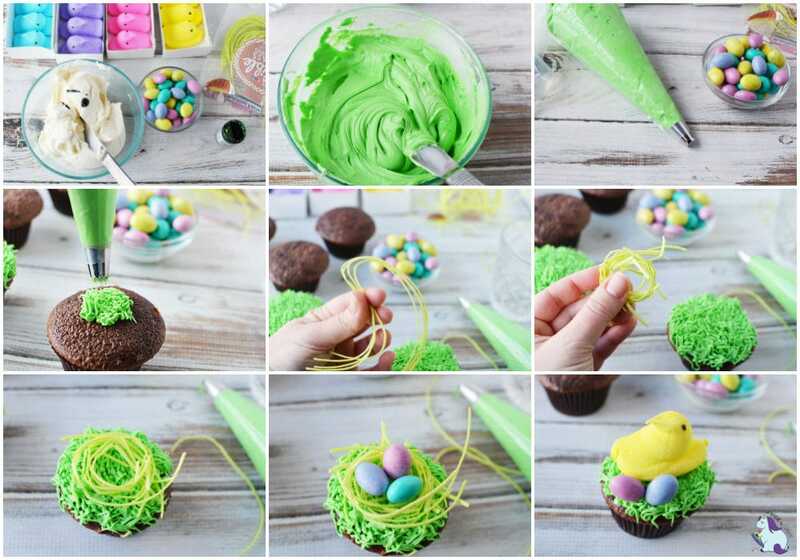 To make the Bird Nest cupcake, place 3 M&M candies on the nest in the center. Repeat until you have all of your cupcakes frosted! For the green frosting, Wilton leaf green gel was used. Nutrition facts are based on similar ingredients when exact information isn’t available. Use different flavored cupcakes or a variety to add more color. Sprinkle edible glitter over the grass for a more magical look. Make our edible fairy toadstools to add to your display! These cupcakes aren’t just for Easter–try adding farm animals or other woodland creatures for year-round fun. 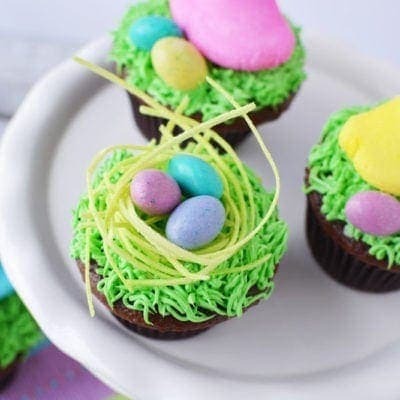 Are Easter cupcakes part of your holiday tradition? Love this super cute recipe. I will definitely try this . Thanks! So much fun and absolutely adorable to make and tasty to eat! These look incredible. They are so cute I wouldn’t even want to eat them….but just look at them. Well done! Though I am sure they are so yummy too. Easter will be at my place and these would be fun to make. Thanks for the idea. I’m glad I found this recipe. It is super cute! I’m going to make them over the weekend with my daughters. These cupcakes look adorable! Great recipe. These are DARLING! 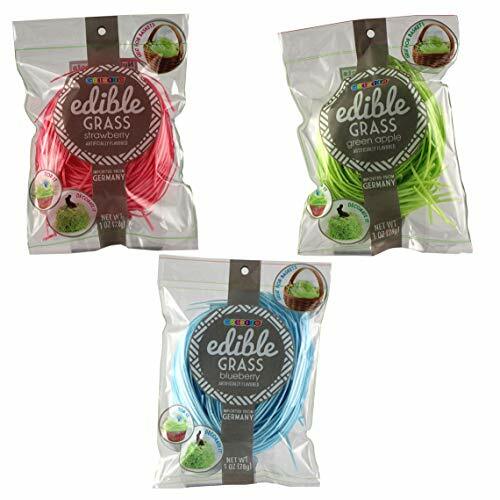 Where would you find “edible grass?” Would I look in the baking aisle or by seasonal? Oh, I’m not sure, I’ve only ever ordered online! These cupcakes are so cute!! I like cupcakes because, well, what’s not to love about cupcakes? These are simply F U N and I think we may do them for our family celebration- but more of a DIY nest cupcake bar. Some of my family doesn’t like frosting as much as others (me) so we can have the cute and fun just how everyone wants! That’s a great idea! I love the cupcake bar concept–I don’t love a ton of frosting either! These are going to be made by us this year. They are just TOOOO cute to pass up! Thank you for a cute dessert for the kiddos! I have seen these made before and have always loved them, but had never thought to attempt making them on my own! Thank you for the recipe!